I am using the Samplitude Pro X3 Suite. I need to use more than 16 MIDI channels in Independence. How do I set up Independence on a few different MIDI ports? AFAIK, VST is limited to 16 Midi Channels, only VST3 can handle more than 16 Midi Channels, but I don't see how this is fully supported in SAM Pro X 3. I tried VST3 plugins with another DAW and could use more than 16 midi channels per instance. I also think, that Independence is not a VST3 plugin anyways. The standalone version of Independence can handle up to 32 midi ports, each with 16 channels. The Independence manual states that it supports 32 MIDI ports and 512 MIDI channels. But I didn't find an indication that VST plugins doesn't support it. I use Independence inside the Samplitude and I need to work on more than 16 MIDI channels. But I can't find where are those settings. Xm. .. I'll have to try ... Thanks for the idea. Tried to upload 2 Independence at the same time. Not help. Still only 16 Midi channels sound. At the same time, on one Midi channel sounds those sounds which are loaded. Previous issue: how to install more than 16 Midi channels in Independence when working in Samplitude Pro X3 Suite? Maybe Krasnet will be able to suggest? Hi! As tdor said earlier with VST you are stucked with 16 midi channels, so the second instance of Independence will work as a new VST instrument with it own 16 midi channels, totalty independent of the first one. How are you using Independence, on one track in Samplitude and using Independence internal mixer? Or as multritrack and using Samplitudes mixer? I write music for theatrical performances. The composition of the orchestra - from small to symphonic. Independence I use it as a multitrack, then I convert all the parts to wave and mix the audio tracks to Samplitude. Now I'm working on a Hymn in which there are about 40 midi instruments. So I need to use more than 16 Midi channels. Open the attachment. Check in the VSTi tab your instrument routing. I would set up the routing as Multi-Channel, Extended Options: All as Stereo. Thanks for the tip. I have tried this option for a long time. Unfortunately-not working. On all loaded Independence, on one channel (for example - on the 1st) all instruments which are installed in each Independence (as they are all directed on one Midi Port) simultaneously sound. This is equivalent to loading multiple instruments on one Midi channel in one Independence. They will all play simultaneously (on one Midi channel). And I want to find out how to set multiple MIDI Ports in Independence. Roughly the way it is done in Kontakt. 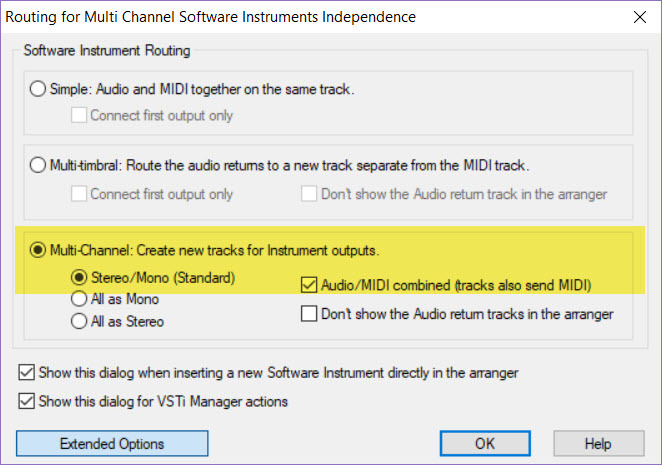 Independence doesn't support multiple MIDI ports. So are limited to 16 out. Every time you add a new patch it will be set incrementally to the next MIDI channel. The reason you're hearing everything at once is because your MIDI output in Samplitude is probably set to all. The best ways to create a multi-out instrument and then the midi inputs are automatically assigned. This should give you 16 tracks with each one routed to the different midi channel. Although my tests seem to show that Independence doesn't support 16 stereo audio outs.You will get 8 stereo and 8 mono using the setting I've shown you above. If you choose "All as Stereo" you will end up with 12 stereo tracks. Personally if you want multiple MIDI ports I would continue using Kontakt. Plus as far as I understand MAGIX will no longer develop Independence beyond its current implementation. Thank you for the answer. I, in the work, use such installations which you showed. 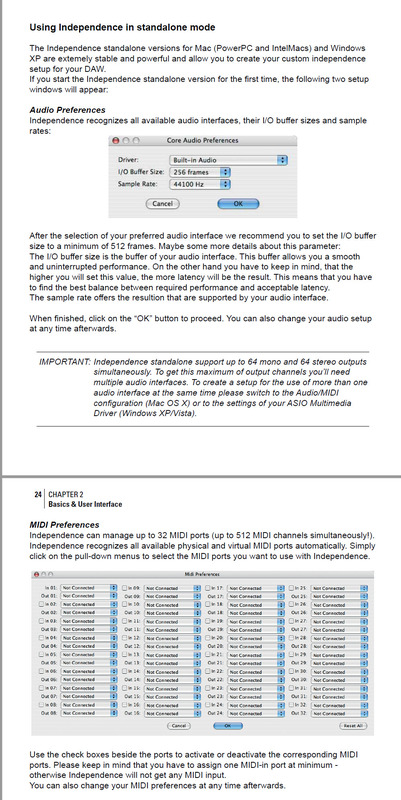 It is not clear that the manual says Independence supports 32 Midi Ports. But in fact only 1 is used. After all, Independence is a part of Samplitude Pro X3 Suite. Why can't I use the other Midi Ports? If this feature is not implemented in Independence (Samplitude), then the manufacturer has deceived me and sold a program that does not meet the stated characteristics. Why is this feature implemented in Kontakt and not in Independence? If I don't find the option to enable additional Midi Ports, then I need to ask the manufacturer to fix these errors, because the availability of these features determined my choice when buying Samplirude Pro X3 Suite. OK I just looked in the manual and it does say in fact independent supports 32 MIDI ports. Although so far I haven't found a way to enable them. Let me look into it and I will get back to you. It appears after investigation that only the stand-alone version of Independence supports 32 MIDI ports. Why do you need so many MIDI ports are you using multiple input sources? You should be able to use multiple instances of independents and assign them to different ports. Also I did some research on Kontakt and you can only use one midi port inside your DAW so it's the same as Independence in Samplitude. It seems that Kontakt and Independence both only allow extra MIDI ports in stand-alone mode. See this answer to a question from a Cubase user on the native instruments forum. 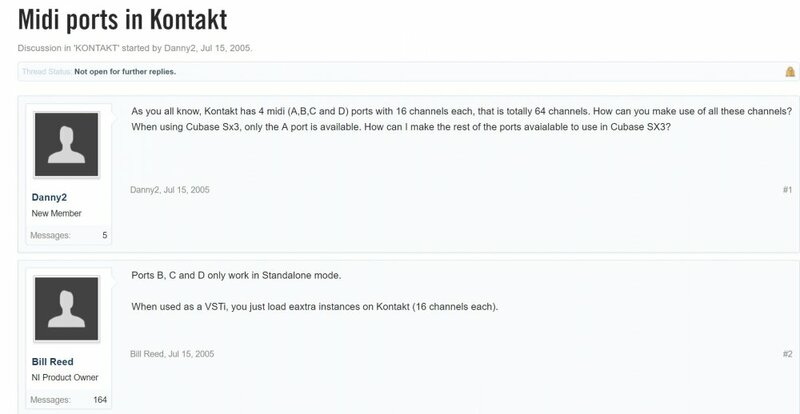 Also the guy made the same suggestion to load extra instances of Kontakt if you need extra ports. Thanks for the reply. I understand that if I install another Independence, there will be an additional 16 Midi channels. But I bought the Samplitude via mail, in a set of 12 DVDs. When you install from disk, Independence is automatically installed as a VSTi. How to install Independence again - I don't know. 1.) Independence Standalone can use up to 32 MIDI ports with 16 MIDI channels on each port. This feature is needed for situations like " several master keyboards playing several sounds" for example, large arrangements controlled from external DAWs or whatever out of the ordinary situation you may think of. Those situations do not include a host DAW for Independence. 2.) The VSTi plugin version of Independence does NOT NEED more than one port with 16 channels , nor does Kontakt or any other plugin for that matter. The reason for that is that the DAW (host) is capable of providing those different ports, if need be even MORE than the 32 port which Independence standalone can provide. 3.) If you do need more than 16 MIDI channels you need to load a second instance of Independence, which will give you another 16 MIDI channels. BUT the second instance of Independence will NOT give you MIDI channels 17-32. It will give you another set of MIDI channels 1-16. Those can be assigned from another MIDI port which the DAW will provide. Another port usually means another master keyboard (even though there are master keyboards on the market that actually can give you more ports, like Nektar for example), but this is just by the way. Now lets have a look at the first instance of Independence. You load your first sound, which will be Layer 1. By default this Layer would be assigned to MIDI channel 1, but this can be changed if needed. Now you add an second Layer 2. By default this Layer would be assigned to MIDI channel 2, but this also can be changed if needed. Keep adding Layers as needed, in your case up to 16. Make sure each Layer has it´s own MIDI channel. Once you have 16 Layers on different MIDI channels your instance of Independence would be - let´s say - "full", at least for your needs at the moment. Now you load another instance of Independence. If you have the same MIDI port (master keyboard) assigned to both instances of Independence and play on MIDI channel 1, then you will probably hear the first Layer of the first insance of Independence as well as the first Layer of the second instance of Independence. To avoid that you simply have to TURN OFF the Monitor Button on the corresponding Samplitude track of the first instance, as this is NOT to listen to the already recorded stuff, but to the momentarily played stuff. To be save and not get confused you can also turn off ALL Monitor buttons of the first instance of Independence in Samplitude. I think basically you´re on the right track and all is actually working the way you want. It´s just getting your head around the difference between the direct approach of MIDI port and channel assignement in the standalone version and the assignement via Sammplitude for the VSTi version. PS!!! : There is NO NEED TO INSTALL a second instance of Independence. Once a plugin is installed you can load as many instances as your computer can handle. The only thing that´s important to know is that you have to load it on ANOTHER TRACK. You CANNOT LOAD multiple VST-instruments on the same track. 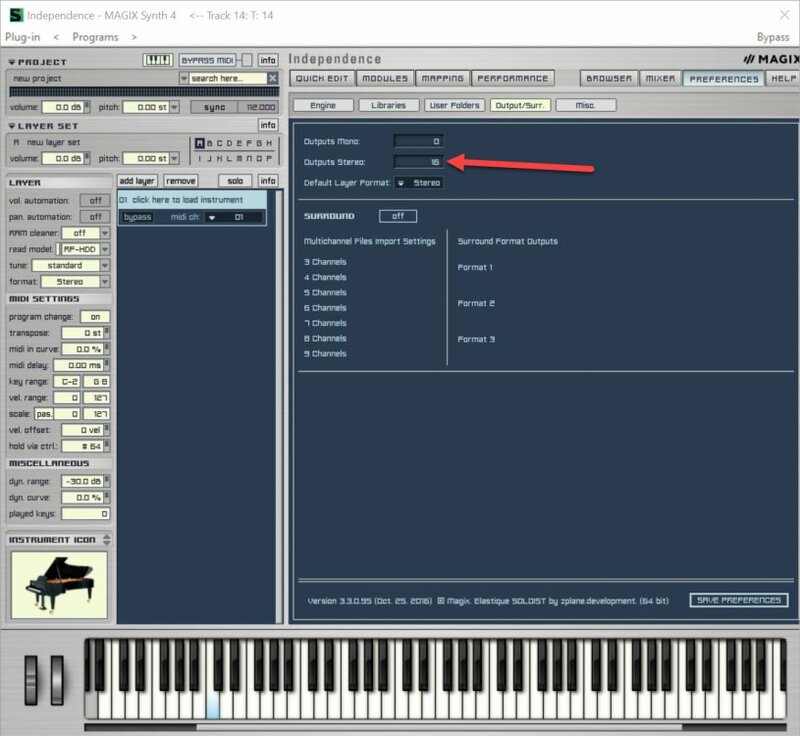 If you have the same MIDI port (master keyboard) assigned to both instances of Independence and play on MIDI channel 1, then you will probably hear the first Layer of the first insance of Independence as well as the first Layer of the second instance of Independence. That's what's happening to me. But I need to hear the sound of all the orchestra instruments at the same time. I understand that you can turn off the sounding instruments in parallel. But that's not my way. So I'm trying to find a way to add at least another 16 Midi channels. How exactly do you trigger the sounds? Are they recorded as MIDI data? Are they coming from an external Sequencer? Are you playing 32 MIDI channels "live" on one or more master keyboards? I play the Midi keyboard parts of each instrument and record it on a separate track. The simultaneous sound of all the instruments of the orchestra I need to refine tonal and color balance. So it´s just the playback. That´s no problem at all. Just switch off the monitor button on the tracks that are already recorded. Just have it on on the one where you play the keyboard. I, perhaps, it is unclear explained. I do all the orchestrations in Midi format. And it is in Midi format that I need to hear the orchestra instruments at the same time. And since there are more than 16 instruments in the orchestra, I need more than 16 Midi channels. You can, of course, add Kontakt or something else. But I would like to do with the capabilities of its Samplitude. Loading 2 or 3 Independence VSTi's work well here without interference with one another. Unfortunately all monitor input are active when you load the Independence VSTi in Samplitude. So first you need to turn them off. Another thing, you have to manualy setup the outputs in the mixer inside Independence, otherwise all sound goes to the first output and you cant mix them separete in the Samplitude mixer. I think you missing the point, you are confusing ourself with midi channels & intrument channels, there are only 16 midi channels available in Samplitude and Independece, so to get more than 16 instruments you need to use 2 or more Independece VSTi or Kontakt or any other VSTi you might use, all of them will have 16 midi channels each. As Independece have the choice of 8 stereo + 8 mono or 12 stereo i would choose 12 stereo, then you need 4 Independece VSTi's for +40 channels (up to 48 channels) but that of course depends if you use stereo or mono instruments. Actually I discovered yesterday you can change the output configuration in the preferences. I set it to 16 stereo and restarted independence and now I have 16 stereo outputs.